Present state: Station House and section of footbridge still present as a private residence. Rest of site has been demolished and is now occupied by a car park and Ranger Centre. 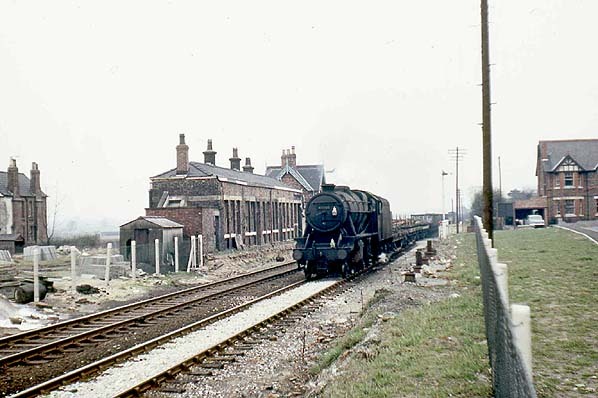 Notes: Lymm Station was situated on what was to become known as the Ditton Junction to Skelton Junction line. It was opened on 1.11.1853 as part of the Warrington and Stockport Railway which ran from a temporary terminus at Wilderspool in Warrington to Altrincham where it connected with the MSJA line into Manchester. At the same time the St. Helens Railway (formerly the St. Helens and Runcorn Gap Railway) opened a line from Garston Dock to a temporary terminus at Warrington Whitecross. 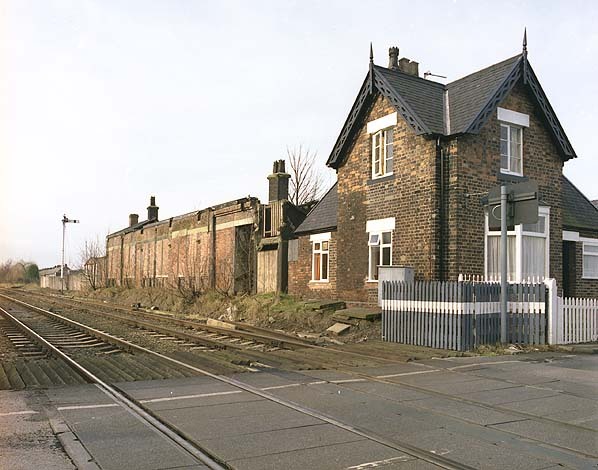 On the 1.5.1854 the two lines were joined together at a new joint station Warrington Arpley. This now created an alternative Liverpool to Manchester route to that of the LNWR. However by 1860 the LNWR had a lease on the Warrington and Stockport line and on 1.1.1861 bought it out completely. It was only then a matter of time and on 1.8.1864 the St. Helens Railway was absorbed also. This was to seal the lines fate as from this point forward it would always be a secondary route as far as passenger services were concerned. A number of local services used various parts of the line with most through trains being between Ditton Junction and Manchester Oxford Road. Some trains did run from Liverpool Lime Street to Manchester but they were not very frequent. This was the service that continued up to the end of passenger services and in later years it was provided by a tank engine and push/pull sets of coaches. There was a brief interlude when DMUs were tried in the late 1950's but by the early 1960's the service was back in the hands of the push pull sets. Lymm Station closed to passengers on 10.9.1962 when all regular passenger services on the line ceased. The line continued in use as a busy freight artery particularly for coal heading west towards Fiddlers Ferry Power Station and Garston Docks. Even in the early 1980s there were 60 trains per day booked to use the line east of Warrington. However expensive repairs were needed to the bridge over the Manchester Ship Canal at Latchford and many trains could take alternative routes. The line closed east of Latchford with the last booked trains running on 7.7.1985. In 1988 the line was lifted by a demolition train. 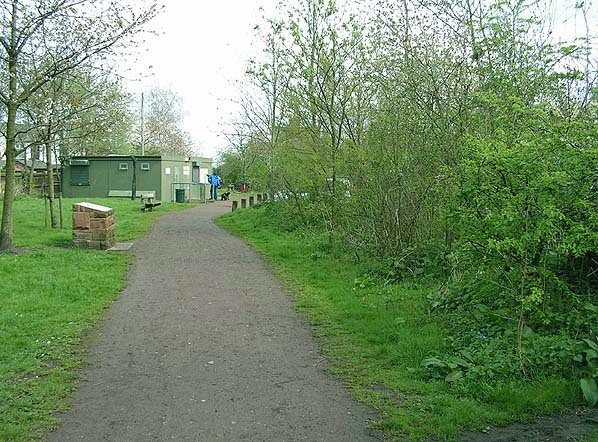 Today the route east of Latchford bridge forms part of the Trans Pennine Trail cycleway and footpath and there is a Rangers Office and Information centre on the site of Lymm Station.